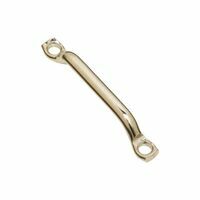 National Hardware Rope Loop, Low Profile, Series: 2056BC, 1/2 in, 95 lb Working Load, Steel, Nickel Plated, 2.83 in Length X 0.37 in Width X 0.8 in Height, 0.2 in Mounting Hole Diameter, For Use in Marine, Agricultural and Many Other Applications High quality ASA Standard chain links. Every pin, bushing, roller and side plate is shot-peened during production to increase metal fatigue resistance. Heavy roller chain (i.e. 60H or 80H roller chain) provides extra thickness of side plates which affords greater capacity of shock load without experiencing side plate metal fatigue. High quality ASA Standard chain links. Every pin, bushing, roller and side plate is shot-peened during production to increase metal fatigue resistance. Heavy roller chain (i.e. 60H or 80H roller chain) provides extra thickness of side plates which affords greater capacity of shock load without experiencing side plate metal fatigue. 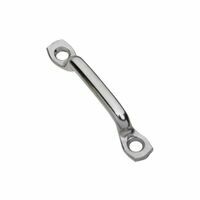 National Hardware Strap Loop, Low Profile, Series: 2055BC, 2 in, 95 lb Working Load, Steel, Nickel Plated, 3.77 in Length X 0.41 in Width X 0.59 in Height, 0.2 in Mounting Hole Diameter, For Use in Marine, Agricultural and Many Other Applications National Hardware Rope Cleat, Series: 3200BC, 4-1/2 in Length, 55 lb Load, Die Cast Zinc, Nickel Plated, For Fastening Rope to Secure Sun Screens, Awnings, Tarps, Small Boats and Other Applications For axles, garden furniture, plant stakes and tent pegs. 1/16" Thick. National Hardware Rectangular Bar, Series: 4201BC, 1/2 in Width, 48 in Overall Length, 1/16 in Thickness, Aluminum, Mill, For Reinforcement, Base Plates and Repair Projects Die cast construction, zinc finish. High quality ASA Standard chain links. Every pin, bushing, roller and side plate is shot-peened during production to increase metal fatigue resistance. Heavy roller chain (i.e. 60H or 80H roller chain) provides extra thickness of side plates which affords greater capacity of shock load without experiencing side plate metal fatigue. 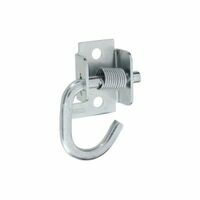 National Hardware Tarp/Rope Hook, Mediumweight, Series: MP2052B, 0.72 in Wire Diameter, 260 lb, 0.26 in Mounting Hole, 1.1 in Hole Spacing, Steel, Zinc Plated, 0.36 in Diameter, 3-3/4 in Length, 1-3/4 in Width, BHMA A138.18, For Interior and Exterior Applications High quality ASA Standard chain links. Every pin, bushing, roller and side plate is shot-peened during production to increase metal fatigue resistance. Heavy roller chain (i.e. 60H or 80H roller chain) provides extra thickness of side plates which affords greater capacity of shock load without experiencing side plate metal fatigue. High quality ASA Standard chain links. Every pin, bushing, roller and side plate is shot-peened during production to increase metal fatigue resistance. Heavy roller chain (i.e. 60H or 80H roller chain) provides extra thickness of side plates which affords greater capacity of shock load without experiencing side plate metal fatigue. Use for motor mounts, drawer slides, bicycle racks and bed frames. Use for gate latches, safety guards, support braces and ladder hangers. Used for ladder hangers, support braces, safety guards and gate latches. High quality ASA Standard chain links. Every pin, bushing, roller and side plate is shot-peened during production to increase metal fatigue resistance. Heavy roller chain (i.e. 60H or 80H roller chain) provides extra thickness of side plates which affords greater capacity of shock load without experiencing side plate metal fatigue. Solid brass fasteners with nickel plating will not rust. Used to repair canvas, tarpaulins, tents, awnings, sailcloth, lawn furniture and pool covers. contains 6 snap fastener sets. Use for cart frames, machine stands, table legs and wire conduit. Used for gate latches, ladder hangers, safety guards and support braces. Use for gate latches, safety guards, support braces and ladder hangers. Use for motor mounts, drawer slides, bicycle racks and bed frames. Used for ladder hangers, support braces, safety guards and gate latches. Used for ladder hangers, support braces, safety guards and gate latches. High quality ASA Standard chain links. Every pin, bushing, roller and side plate is shot-peened during production to increase metal fatigue resistance. Heavy roller chain (i.e. 60H or 80H roller chain) provides extra thickness of side plates which affords greater capacity of shock load without experiencing side plate metal fatigue. National Hardware Spring Rope Hook, Series: 2050BC, 140 lb, 0.28 in Mounting Hole, 1.22 in Hole Spacing, Steel, Zinc Plated, 2.91 in Length, 2.1 in Width, BHMA A138.18, For Interior and Exterior Applications High quality ASA Standard chain links. Every pin, bushing, roller and side plate is shot-peened during production to increase metal fatigue resistance. Heavy roller chain (i.e. 60H or 80H roller chain) provides extra thickness of side plates which affords greater capacity of shock load without experiencing side plate metal fatigue. Use for motor mounts, drawer slides, bicycle racks and bed frames. For axles, garden furniture, plant stakes and tent pegs. 1/16" Thick. Use for gate latches, safety guards, support braces and ladder hangers. For corner braces, garage door, shelving and tool racks. Used for ladder hangers, support braces, safety guards and gate latches. High quality ASA Standard chain links. Every pin, bushing, roller and side plate is shot-peened during production to increase metal fatigue resistance. Heavy roller chain (i.e. 60H or 80H roller chain) provides extra thickness of side plates which affords greater capacity of shock load without experiencing side plate metal fatigue. Solid brass fasteners with nickel plating will not rust. Used to repair canvas, tarpaulins, tents, awnings, sailcloth, lawn furniture and pool covers. Contains 6 screw snap fastener sets. Designed for fastening rope to secure sun screens, awnings, tarps, small boats and other applications. Excellent for marine and other outdoor applications. Steel/die cast metal. Used for gate latches, ladder hangers, safety guards and support braces. High quality ASA Standard chain links. Every pin, bushing, roller and side plate is shot-peened during production to increase metal fatigue resistance. Heavy roller chain (i.e. 60H or 80H roller chain) provides extra thickness of side plates which affords greater capacity of shock load without experiencing side plate metal fatigue. High quality ASA Standard chain links. Every pin, bushing, roller and side plate is shot-peened during production to increase metal fatigue resistance. Heavy roller chain (i.e. 60H or 80H roller chain) provides extra thickness of side plates which affords greater capacity of shock load without experiencing side plate metal fatigue. Used for gate latches, ladder hangers, safety guards and support braces. Used for ladder hangers, support braces, safety guards and gate latches. Use for motor mounts, drawer slides, bicycle racks and bed frames. Used for ladder hangers, support braces, safety guards and gate latches. Use for gate latches, safety guards, support braces and ladder hangers. Use for motor mounts, drawer slides, bicycle racks and bed frames. Use for gate latches, safety guards, support braces and ladder hangers. High quality ASA Standard chain links. Every pin, bushing, roller and side plate is shot-peened during production to increase metal fatigue resistance. Heavy roller chain (i.e. 60H or 80H roller chain) provides extra thickness of side plates which affords greater capacity of shock load without experiencing side plate metal fatigue. High quality ASA Standard chain links. Every pin, bushing, roller and side plate is shot-peened during production to increase metal fatigue resistance. Heavy roller chain (i.e. 60H or 80H roller chain) provides extra thickness of side plates which affords greater capacity of shock load without experiencing side plate metal fatigue. Used for gate latches, ladder hangers, safety guards and support braces. Use for motor mounts, drawer slides, bicycle racks and bed frames. Use for gate latches, safety guards, support braces and ladder hangers. Solid brass fasteners with nickel plating will not rust. Kit Contains: 2-piece setting tool with knurled body for greater comfort and safety, and 6 fastener sets. High quality ASA Standard chain links. Every pin, bushing, roller and side plate is shot-peened during production to increase metal fatigue resistance. Heavy roller chain (i.e. 60H or 80H roller chain) provides extra thickness of side plates which affords greater capacity of shock load without experiencing side plate metal fatigue. Use for wire protectors, trailer hitches, door framing and pipe hangers. Designed for frames, railings, truck racks, gates and other commercial and industrial applications. Electric-resistance welded. Hot-rolled plain steel. Meets ASTM Specification A513. Used for gate latches, ladder hangers, safety guards and support braces. High quality ASA Standard chain links. Every pin, bushing, roller and side plate is shot-peened during production to increase metal fatigue resistance. Heavy roller chain (i.e. 60H or 80H roller chain) provides extra thickness of side plates which affords greater capacity of shock load without experiencing side plate metal fatigue. Used for ladder hangers, support braces, safety guards and gate latches. Used for motor mounts, drawer slides, bicycle racks and bed frames. Used for gate latches, ladder hangers, safety guards and support braces. Use for motor mounts, drawer slides, bicycle racks and bed frames. Use for wire protectors, trailer hitches, door framing and pipe hangers. Use for motor mounts, drawer slides, bicycle racks and bed frames. Use for motor mounts, drawer slides, bicycle racks and bed frames. Use for cart frames, machine stands, table legs and wire conduit. High quality ASA Standard chain links. Every pin, bushing, roller and side plate is shot-peened during production to increase metal fatigue resistance. Heavy roller chain (i.e. 60H or 80H roller chain) provides extra thickness of side plates which affords greater capacity of shock load without experiencing side plate metal fatigue. Use for gate latches, safety guards, support braces and ladder hangers. Use for gate latches, safety guards, support braces and ladder hangers. Used for ladder hangers, support braces, safety guards and gate latches. Use for motor mounts, drawer slides, bicycle racks and bed frames. Use for wire protectors, trailer hitches, door framing and pipe hangers. National Hardware Rope Cleat, Series: V3202, 4-1/2 in Length, 30 lb Load, Stainless Steel, Stainless Steel, BHMA A138.18, For Fastening Rope to Secure Sun Screens, Awnings, Tarps, Small Boats and Other Applications Use for motor mounts, drawer slides, bicycle racks and bed frames. For axles, garden furniture, plant stakes and tent pegs. 1/16" Thick. National Hardware Channel, Series: 4208BC, 1/4 in Width, 72 in Length, 1/16 in Thickness, 0.27 in Slot, Aluminum, Mill, For Trim Work, Frame Work and Reinforcement Projects Used for gate latches, ladder hangers, safety guards and support braces. Used for motor mounts, drawer slides, bicycle racks and bed frames. Use for gate latches, safety guards, support braces and ladder hangers. 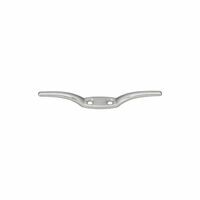 Used for bed frames, bicycle racks, drawer slide and motor mounts. Used for ladder hangers, support braces, safety guards and gate latches. Designed for attaching Durock, Wonderboard or equivalent glass-mesh cement backerboard to wood or light gauge steel studs. Patented serrated head design countersinks for flush seating at any angle, providing a smooth surface for tile. Star drive recess with included T-25 bit provides for one-handed installation. Feature a Climacoat corrosion resistant finish that prevents rust from bleeding into grout. Perfect for use in high moisture areas such as baths, showers, countertops, and floors. Conforms to ANSI A108.11 for cement board attachment. For axles, garden furniture, plant stakes and tent pegs. 1/16" Thick. For corner braces, garage door, shelving and tool racks. Designed for frames, railings, truck racks, gates and other commercial and industrial applications. Electric-resistance welded. Hot-rolled plain steel. Meets ASTM Specification A513. Use for cart frames, machine stands, table legs and wire conduit. Use for wire protectors, trailer hitches, door framing and pipe hangers. National Hardware Channel, Series: 4208BC, 1/2 in Width, 72 in Length, 1/16 in Thickness, 0.27 in Slot, Aluminum, Mill, For Trim Work, Frame Work and Reinforcement Projects Used for braces and garage doors. Approximately 14 gauge. For axles, garden furniture, plant stakes and tent pegs. 1/16" Thick. Designed for attaching Durock, Wonderboard or equivalent glass-mesh cement backerboard to wood or light gauge steel studs. Patented serrated head design countersinks for flush seating at any angle, providing a smooth surface for tile. Star drive recess with included T-25 bit provides for one-handed installation. Feature a Climacoat corrosion resistant finish that prevents rust from bleeding into grout. Perfect for use in high moisture areas such as baths, showers, countertops, and floors. Conforms to ANSI A108.11 for cement board attachment. Used for ladder hangers, support braces, safety guards and gate latches. Used for ladder hangers, support braces, safety guards and gate latches. For corner braces, garage door, shelving and tool racks. Use for motor mounts, drawer slides, bicycle racks and bed frames. Use for wire protectors, trailer hitches, door framing and pipe hangers. Use for gate latches, safety guards, support braces and ladder hangers. Used for ladder hangers, support braces, safety guards and gate latches. Use for wire protectors, trailer hitches, door framing and pipe hangers. Use for cart frames, machine stands, table legs and wire conduit. Used for ladder hangers, support braces, safety guards and gate latches. Designed for frames, railings, truck racks, gates and other commercial and industrial applications. Electric-resistance welded. Hot-rolled plain steel. Meets ASTM Specification A513. Stanley Structural Plate, Slotted, 60 in Length, 1-3/8 in Width, 0.074 in Thickness, Steel, Galvanized Use for gate latches, safety guards, support braces and ladder hangers. Used for motor mounts, drawer slides, bicycle racks and bed frames. Designed for attaching HardieBacker or equivalent fiber cement backerboard to wood or light gauge steel studs. Patented serrated head design countersinks for flush seating at any angle, providing a smooth surface for tile. Star drive recess with T-25 bit provides for one-handed installation. Climacoat corrosion resistant finish prevents rust from bleeding into grout and are perfect for use in high moisture areas. Conforms to ANSI A108.11 for cement board attachment. Used for cart frames, machine stands, table legs and wire conduit. Designed for frames, railings, truck racks, gates and other commercial and industrial applications. Electric-resistance welded. Hot-rolled plain steel. Meets ASTM Specification A513. Used for motor mounts, drawer slides, bicycle racks and bed frames. Used for gate latches, ladder hangers, safety guards and support braces. Use for motor mounts, drawer slides, bicycle racks and bed frames. Use for cart frames, machine stands, table legs and wire conduit. Used for motor mounts, drawer slides, bicycle racks and bed frames. Use for motor mounts, drawer slides, bicycle racks and bed frames. National Hardware Solid Flat, Series: 4064BC, 1-1/4 in Width, 48 in Overall Length, Hot Rolled Steel, ASTM A36, Plain, For Use as Supports for Construction or Industrial Applications Used for bed frames, bicycle racks, drawer slide and motor mounts. Use for wire protectors, trailer hitches, door framing and pipe hangers. For axles, garden furniture, plant stakes and tent pegs. 1/16" Thick. Used for ladder hangers, support braces, safety guards and gate latches. For corner braces, garage door, shelving and tool racks. Used for motor mounts, drawer slides, bicycle racks and bed frames. Use for motor mounts, drawer slides, bicycle racks and bed frames. Use for cart frames, machine stands, table legs and wire conduit. 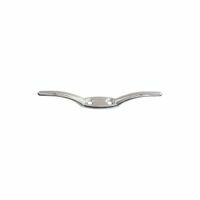 Used for bed frames, bicycle racks, drawer slide and motor mounts. Use for cart frames, machine stands, table legs and wire conduit. Used for braces and garage doors. Approximately 14 gauge. Use for gate latches, safety guards, support braces and ladder hangers. Used for ladder hangers, support braces, safety guards and gate latches. Used for motor mounts, drawer slides, bicycle racks and bed frames. Use for motor mounts, drawer slides, bicycle racks and bed frames. Use for motor mounts, drawer slides, bicycle racks and bed frames. Used for gate latches, ladder hangers, safety guards and support braces. K & S Round Tube, 5/16 in Nominal, 0.284 in Inside Diameter, 36 in Length, 0.014 in Thickness, 900 - 1200 deg F, Seamless, Aluminum, ASTM B210, For Plumbing, HVAC and Automotive Stanley Structural Plate, Slotted, 60 in Length, 2-13/16 in Width, 0.074 in Thickness, Steel, Galvanized Used to repair canvas, tarpaulins, tents, awnings, sail cloth, lawn furniture and pool covers. 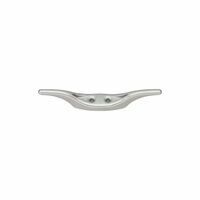 Used for bed frames, bicycle racks, drawer slide and motor mounts. Used for cart frames, machine stands, table legs and wire conduit. Use for gate latches, safety guards, support braces and ladder hangers. Used for motor mounts, drawer slides, bicycle racks and bed frames. For corner braces, garage door, shelving and tool racks. Use for cart frames, machine stands, table legs and wire conduit. For corner braces, garage door, shelving and tool racks. Used for motor mounts, drawer slides, bicycle racks and bed frames. Designed for frames, railings, truck racks, gates and other commercial and industrial applications. Electric-resistance welded. Hot-rolled plain steel. Meets ASTM Specification A513. Use for motor mounts, drawer slides, bicycle racks and bed frames. Used for gate latches, safety guards, support braces and ladder hangers. Used for bed frames, bicycle racks, drawer slide and motor mounts. Used for ladder hangers, support braces, safety guards and gate latches. Used for ladder hangers, support braces, safety guards and gate latches. Use for motor mounts, drawer slides, bicycle racks and bed frames. Use for cart frames, machine stands, table legs and wire conduit. Use for motor mounts, drawer slides, bicycle racks and bed frames. Use for motor mounts, drawer slides, bicycle racks and bed frames. For fastening rope for boats, awnings. Use for gate latches, safety guards, support braces and ladder hangers. Used on campers, trailers, tarps, or general rope tie-down applications. For indoor or outdoor uses. Rust resistant. Heavy gauge steel for added strength. For corner braces, garage door, shelving and tool racks. Use for cart frames, machine stands, table legs and wire conduit. Used for cart frames, machine stands, table legs and wire conduit. Stanley Structural Plate, Slotted, 72 in Length, 2-13/16 in Width, 0.074 in Thickness, Steel, Galvanized Use for cart frames, machine stands, table legs and wire conduit. Used for motor mounts, drawer slides, bicycle racks and bed frames. National Hardware Solid Angle, Series: 4059BC, 36 in Overall Length, 3/16 in Thickness, Hot Rolled Steel, Plain Steel, 2 in Width, For Building Tables, Workbenches, Support Frames, Equipment Stands, Repair Work and Construction Applications Use for gate latches, safety guards, support braces and ladder hangers. Use for gate latches, safety guards, support braces and ladder hangers.